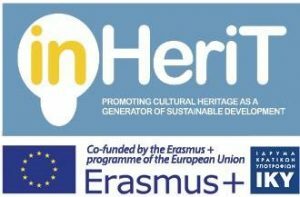 InHERiT is a three-years ERASMUS + KA2 Action programme aiming at raising awareness about the economic value of architectural heritage and its crucial role in creating local and regional development, contributing, thus, to building a “smart, sustainable and inclusive economy” in Europe with high levels of employment, productivity and social cohesion. The partners of InHERiT are the School of Architecture, Technical University of Crete, Greece (leader), the Department of Economics, University of Athens, Greece, the Business School, Middlesex University, London, Maniatakeion Foundation, Greece, Neapolis University Pafos, Cyprus, the Center for Mediterranean Architecture (KEPPEDIH-KAM), Chania, Greece and Fondazione Flaminia, Ravenna, Italy. Researchers: Dr. Yiannis Pissourios, Mr. Michalis Sioulas, Dr. Natia Anastasi, Ms Iliana Keli-Georgiou.